A Useful Toolkit for children on a mission! The nature of play is busy and messy and when children are on a mission, busy creating and thinking,they tend to need tools, quickly! Although they have access to all the tools in this kit (and more) on the shelves in the classroom, sometimes they find it easier to grab a toolkit and take it to where the action is, when playing. 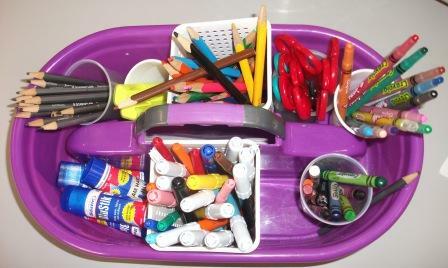 We have 4 of these toolkits in our classroom and they contain pencils, 2 types of crayon, scissors, felt pens (both thick and thin), coloured pencils, staplers, glue sticks and highlighters. A roll of sticky tape and masking tape is also useful but the children find it difficult to manage without the tape holders, If they need these, they usually just get them off the shelf as well. I often wonder what I did before I made these toolkits because they are in use every day in our classroom. The children take them wherever they are playing and need to make something, be it a sign, a label, a repair to a dramatic play construction, anything really. I also find them useful for activities outside, or for small and large group activites on the carpet. The container itself came from the cleaning section of the supermarket and we have them in 4 different colours. I searched for a long time for something like this with a handle in a natural material but to no avail, however these coloured ones look attractive and are just as appealing to the children. Plus they are easier to keep clean. I have used a variety of plastic cups and containers to store the different drawing tools and keep the scissors altogether. When returning the toolkits to their shelves at the end of playtime, sorting out what goes where is another valuable activity in itself. Hide and Seek Word Fun! In our Class We all Fit In Together! Welcoming children to a new school year.